So.. when we were offered the chance to review Nativity 2: Danger in the Manger by Mumsnet, we snapped their hands off and, lo, we were rewarded with not one but TWO David Tennants. Oh, happy day. The follow-up to the box office Christmas hit Nativity! Nativity 2 is set, once again, at St Bernadettes school where Mr Poppy (Marc Wootten) is a classroom assistant with a "unique" way of handling the charges in his care. Headmistress (Pam Ferris) is desperate to recruit a teacher who can handle the exuberant Mr Poppy and *fanfare* enter David Tennant at his most endearing and lovable as the soon-to-be father and jumper wearing, caring teacher Mr Peterson. The basic plot is that Mr Poppy and the class want to enter and win Song For Christmas and everyone is, of course, against them. *Tuts* But there are myriad sub-plots and intertwined story-lines of which one is that the lovely ruffle haired Donald Peterson has a twin, the slicked-back hair, glasses-wearing and rather stern Roderick. David Tennant as Mr Nice and Mr Nasty? Frankly I wouldn't know which way to turn..... but I digress. 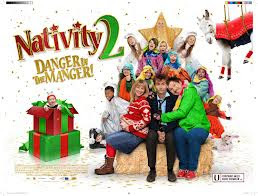 Nativity 2, apart from the two David Tennants, had entertainment, humour, a bit of pathos and all those other things normal people (those not obsessed with David Tennant) might expect from a family film. Nativity 2 IS a real feelgood Christmas film appealing to all age ranges (6, 16, and 47 #facthard), huge fun with some genuinely laugh out loud moments and plenty of happy oooh's and satisfying aaah's. And we all did thoroughly enjoy it. Even The Boy, aged 6, managed to suspend his complete belief that David Tennant is an actual Timelord to become entirely engrossed. His favourite bits were the ones that involved fighting and farting and poo, obviously. The TeenTwins are much more sophisticated, TeenTwin2 loved Joanna Page's coat and headmistress Pam Ferris because, well, she's Pam Ferris. TeenTwin1 loved Marc Wootten, the irrepressible Mr Poppy, and he was quite lovable but, of course, not as lovable as David Tennant. Tennant: "I don't like the look of that woman in row 8, she appears to be drooling"
Nativity 2 Danger in the Manger is the official Children In Need film for 2012, it will be on release in cinemas from November 23rd.